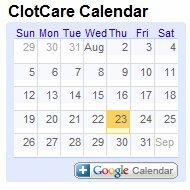 As highlighted in 2008 on ClotCare (clotcare.org/clotcare/dvtpeneverevent.aspx), the Center for Medicare and Medicaid Services announced a decision not to cover a deep vein thrombosis (DVT) and/or pulmonary embolus (PE) that results from hip or knee replacement surgery. Lastly, Streiff and Haut suggest that a more appropriate - and possibly more beneficial approach - would be to apply the policies recommended by the Joint Commission to see that all patients are evaluated for their risk of VTE and that appropriate prophylaxis is employed in such patients. In addition to the issues raised by Streiff and Haut, other points that have been raised in discussions about the "never events" policy is that the policy may result in "gaming" the system by discharging and then readmitting those suspected of having a VTE so that the VTE could be diagnosed at the time of the second admission rather than during the surgical hospital stay. Others have raised the issue of whether diagnostic screening on admission might be employed in some patients to confirm the presence of an old clot prior to the surgery. Clearly, implementation of this policy is likely to continue to generate further discussion. Streiff MB, Haut ER. The CMS Ruling on Venous Thromboembolism After Total Knee or Hip Arthroplasty; Weighing Risks and Benefits. JAMA 2009 (Mar 11); 301(10): 1063-65.